Setting up a domain name may be easier than you may think. Once your domain name is registered, you need to connect it to your hosting server. 1. You have a hosting plan with Namecheap. 2. You have a hosting plan elsewhere and you were provided with the nameservers for your domain. 3. You have your own server or you were provided with a set of host records to connect the domain to your hosting. After the Namecheap nameservers are updated, it may take about 24 hours for the DNS changes to be accepted globally, though, in rare cases it can take up to 48 hours. Please give it some time to propagate. Note1: When switching between Namecheap nameservers, the DNS changes come into the effect within one hour (24+ hours in rare cases). 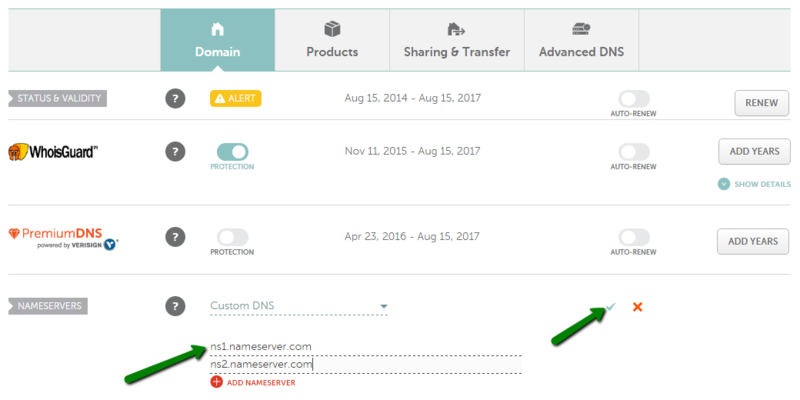 Note2: After setting the nameservers for your domain, you also need to add your domain as Addon to your cPanel if it is not the main domain for your hosting plan. You can find a tutorial for that here. In case you purchased a Reseller hosting plan with us, the private or reseller nameservers that you need to use will be specified in the Hosting Welcome email. It may take about 24-48 hours for your domain to propagate after the nameservers update to be resolving properly all over the world. Note: Some hosting providers may provide you with nameservers with IP addresses for them. Entering nameservers would be enough. Also, if you were provided with the nameservers ending with dots (i.e., ns1.nameserver.com. ), they need to be entered without the dots at the end. 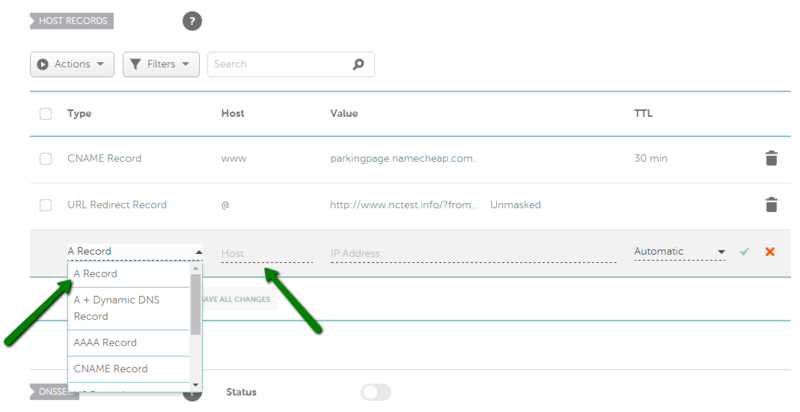 When you have your own hosting server and you know its IP address, you can set up A records for your domain to connect it to the server. Additionally, some hosting providers can provide you with the IP address that should be used for your domain for connecting to your hosting plan. A records should be created in that case as well. - * should be entered as a Host to set up a wildcard subdomain (meaning it will point all non-existent subdomains to your hosting). Note: TTL is the time during which the data of your host record lingers after the record is updated or removed. If you are not sure what TTL to use, simply leave it as Automatic. Usually, it takes about 30 minutes for the newly created records to take effect. After the records are added, you need to check if there are any records for the same host name and remove them as they will be conflicting with your records. The records you need to check may be of Unmasked/Masked/Permanent Redirect, A or CNAME record types. 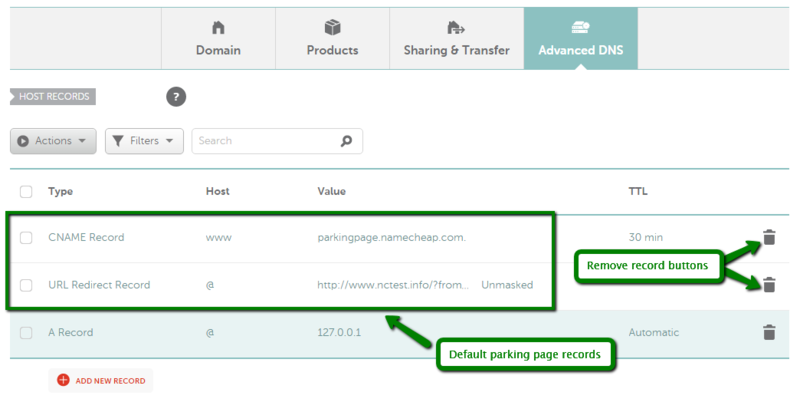 A newly registered domain will have the records for our Parking page set by default. 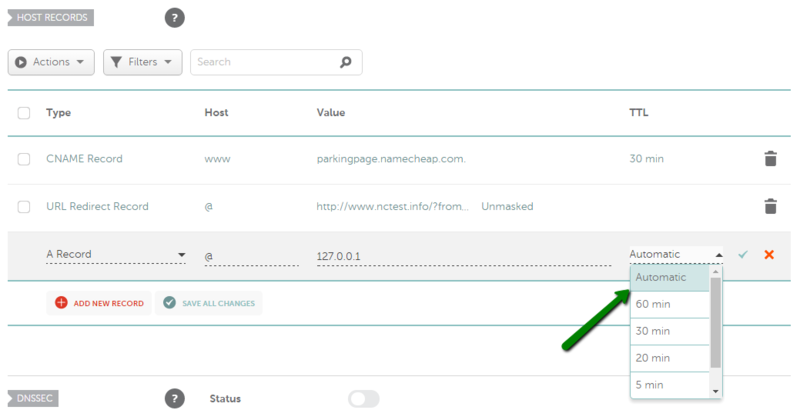 These records are URL redirect for @ host pointing to http://www.domainname.tld/ and CNAME record for www host pointing to parkingpage.namecheap.com. These records should always be removed after setting up custom host records for your domain.